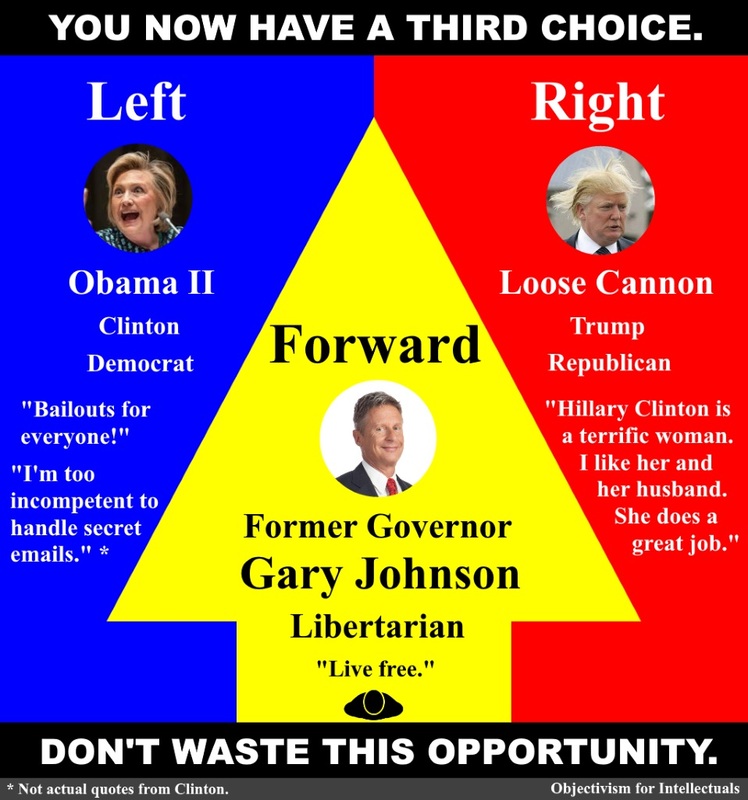 The Libertarian Party’s presidential nominee, former governor Gary Johnson, is definitely not a perfect candidate from an Objectivist perspective. But he has been doing well in the polls, and I think he’s a much better alternative to Hillary Clinton and Donald Trump. You can take a look at his website at GaryJohnson2016.com and watch his interviews on YouTube to get a sense of his qualifications and policies. By and large, libertarians advocate limited government and property rights in a way that approximates the founding principles of the United States, and the Objectivist political viewpoint. But they are not Objectivists and they lack a good, consistent philosophical foundation for their political ideas. Thus they don’t provide the best arguments for liberty and often advocate certain political ideas that are at odds with Objectivist politics. The lack of a consistent, reality-based philosophy also means that libertarians will not be able to sustain liberty in the US in the long term. I don’t consider the Libertarian Party the “party of the future,” in the sense of being a political expression of a future ideal society. That would be something like the nascent American Capitalist Party. But I do think that the movement away from the corrupt, decaying, proto-fascist Democrats and Republicans, toward a libertarian third party is a step forward. It at least brings the critically important issue of personal liberty versus authoritarianism of all sorts, into the foreground of debate. Instead of just two parties bickering over whether to regulate people’s economic lives more, or personal lives more, you will have a major third party calling into question the need to heavily regulate either sphere. You will have a major party standing up for personal choice and against government coercion in all major areas of life. I’m continually amazed at people’s capacity to hold inconsistent philosophical ideas for long periods. American conservatives have voted on a mixture of religious faith–which logically leads to authoritarianism–and a semblance of economic freedom for over a hundred years. American leftists have voted on a mixture of Marxist economic totalitarianism and personal freedom of lifestyle for just as long. Libertarians too are a mixture: political liberty in general (mostly) and a moral outlook largely composed of altruism and subjectivist emotionalism. This mixture is at least closer to what the US had culturally in the early 1800s. So from an Objectivist perspective, the Libertarian Party is not a long-term fix to US politics and culture. But what it represents–in its better forms–is a partial turning back of the cultural clock. Ayn Rand was born too late to stop the American slide into the present collectivist-altruist-statist cultural milieu. But she influenced the libertarians politically, and libertarianism has been growing. If libertarianism becomes dominant, Objectivism gets a second chance to transform the culture to one of reason, individualism and egoism. I would much rather be arguing with a culture of libertarians that their political ideas require Ayn Rand’s philosophy to be properly grounded, than desperately fighting for my right to speak against Marxists or religious zealots. Even if libertarianism doesn’t become dominant, but only more culturally significant, that should have a positive impact on how many people read Ayn Rand’s works and how seriously they take them. And it is Ayn Rand’s works that truly point the way forward, to a future of lasting freedom and prosperity. Let’s get Gary Johnson seriously noticed this election! Feel free to share the image above. This entry was posted in Commentary, Politics and tagged atheism, Ayn Rand, Donald Trump, Gary Johnson, Hillary Clinton, libertarianism, liberty, Objectivism, religion, Trump by Sword of Apollo. Bookmark the permalink.